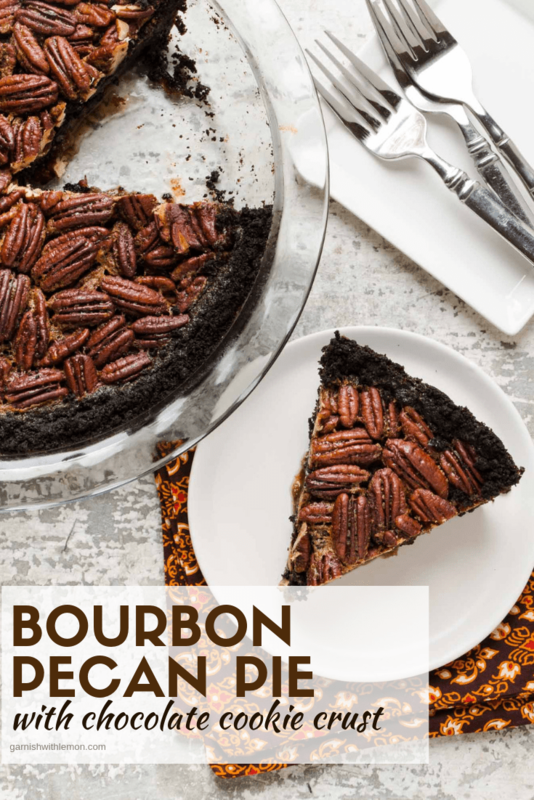 This Bourbon Pecan Pie with Chocolate Cookie Crust is a fun twist on a favorite holiday pie recipe! 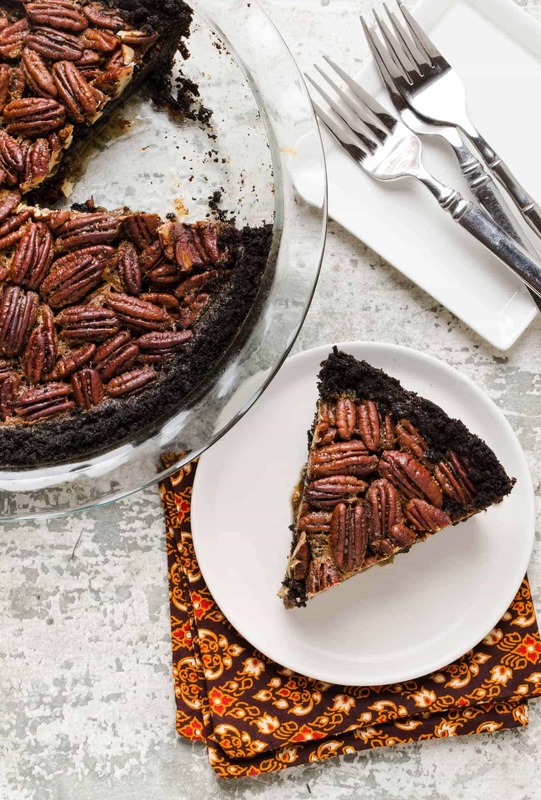 This Bourbon Pecan Pie with Chocolate Cookie Crust is definitely not your typical pecan pie. For starters, I crushed up chocolate wafers to make a cookie crust instead of your typical pastry crust. I also used dark brown sugar, which gives it the richer color you see in the pictures. (I’m coming clean here; the only reason I used dark brown sugar was because that’s all I had in the house. The moral of my story is you can use light or dark brown sugar and still get great results!) This pecan pie is also made without corn syrup because I didn’t want an overly sweet pie. And, just because I could, I threw in a splash of bourbon. Chocolate, Pecans, Bourbon…what’s not to love? Tip: Not a bourbon fan? Try rum or omit the liquor entirely. The pie comes together rather quickly and can be made the day before if you’re looking to get ahead in your holiday baking. Toasting the pecans is not necessary, but I like the depth they bring the dessert. Not a bourbon fan? When ready to serve, feel free to add a dollop of whipped cream or ice cream on top if you have a major sweet tooth. 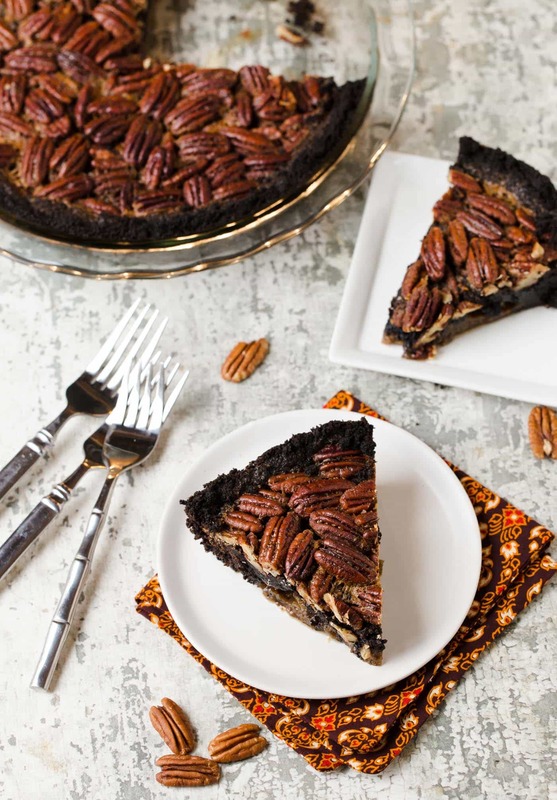 This Bourbon Pecan PIe with Chocolate Cookie Crust is an amazing addition to your holiday dessert menu! Place cookie wafers in a food processor and pulse until you have fine crumbs. Melt 6 tablespoons butter and combine with cookie crumbs. Press mixture into a 9 inch pie plate and bake for 7-8 minutes. Remove from oven and let cool slightly. Raise oven temperature to 400 degrees. Meanwhile, whisk together eggs and water in a medium bowl. Melt remaining 4 tablespoons butter and add to egg mixture along with brown sugar, salt, bourbon and vanilla. Stir until thoroughly combined. Place pecans in pie crust and pour custard mixture over the top of the nuts. Bake for 10 minutes and then reduce heat to 325 degrees. Continue to bake until the center of the pie is no longer wiggly, anywhere from 55-65 minutes. This recipe was easy for me to follow and make. I substituted Oreo’s for the crust as I could not find the Nabisco chocolate wafers. This pie was absolutely delicious. It was a hit during Thanksgiving. We had this pie and a regular pecan pie for comparison. This Bourbon Pecan Pie’s flavor was so fantastic the other pecan pie seemed so bland and boring. Oreos sounds like an amazing substitution; I’m so glad everyone enjoyed it! Thanks for letting us know how it worked for you. We love our MN readers!! This looks amazing. 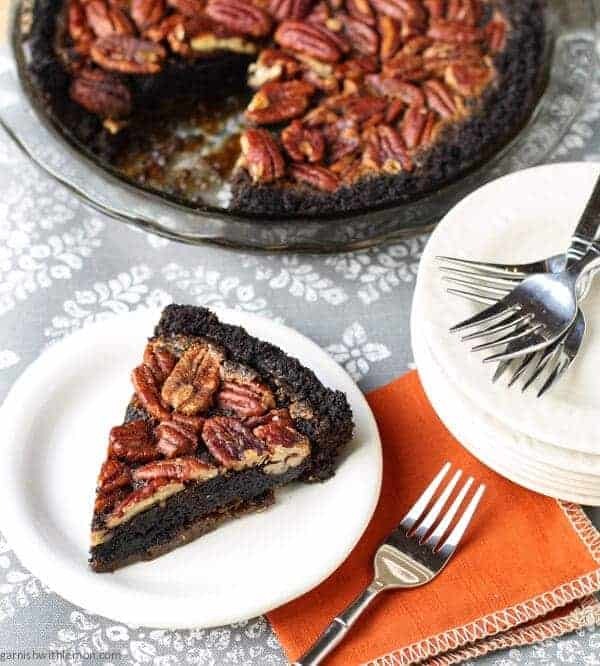 Almost like a brownie pie with pecans (and bourbon). I’ll have to try it. It’s kind of a mashup of some of my favorite things, Renee. All delicious! My pie didn’t turn out as I expected, what could I have done wrong? The eggs were room temp! Should I have used cold eggs? I also had to use the oreos, so the cookies rose and the batter went down to the bottom. Hi Cleshia, I’ve never used Oreos for the crust. Are you saying the crust floated to the top?